EARLY SEASON SPECIAL: 15% discount on any charter booked to take place between Nov. 11th and Dec. 14th, 2013. No other specials can be combined with this special. Minimum 5 nights. 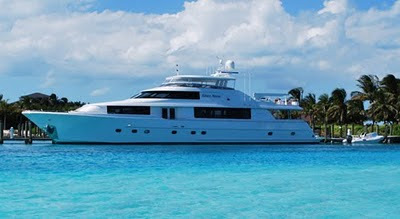 Refit in 2010, the 112' Westport Motor Yacht Silver Moon is available for charter in Florida and the Bahamas. The master stateroom is located below deck, amidships and forward of the two guest staterooms. The master features a king size bed, his and hers master bath with large shower and Jacuzzi tub, and cedar lined closets. There is a flat screen TV and full entertainment center including: Direct TV / DVD / CD/ Stereo. The VIP stateroom is located below deck and forward of the galley, she features a queen size bed, full bathroom with shower and cedar lined closet. There is a flat screen TV and full entertainment center including: Direct TV / DVD/ CD / Stereo. The port VIP stateroom is located below deck, amidships and aft of the master. She features a queen size bed full bathroom with shower and cedar lined closet. There is a flat screen TV and full entertainment center including: Direct TV / DVD/ CD / Stereo. The starboard guest room is located below deck, amidships and aft of the master. This room can be set up with two twin beds or converted to a king size bed, depending on the guests on board. She features a full bathroom with shower and cedar lined closet. There is a flat screen TV and full entertainment center including: Direct TV / DVD/ CD / Stereo. Click here for special rates and holiday availability.